Is Apple Working On its Own TV? 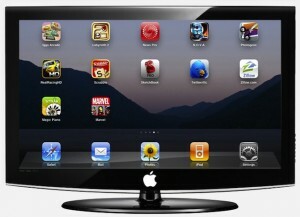 Sources indicate that Apple is working on its own television, with plans to release the TV in 2012. According to several Venture Beat sources in Silicon Valley, Apple has been working on technology to deliver video to televisions and will be able release its own-branded TV next year, incorporating the technology its started using in the Apple TV set-top box into an actual television. The sources (which its worth mentioning are mostly analysts) think that the television will run a version of iOS, allowing the iTV to run many of the same apps that are currently run on the iPhone and iPad. Steve Jobs reportedly mentioned last year that it made sense to Apple to start integrating its technology into televisions, and now that the price-point for televisions has dropped below $1k, it may be the perfect time for Apple to get into the TV market. All of this certainly speculative at this point, but also certainly food for thought. The Apple TV has been a steady seller for Apple, it make sense that the company might consider taking the technology a step further and sell its own TVs. What do you think about the concept of an actually Apple-branded television? What would you like to see in one? Would you buy one?